The Sandy River Clean up was a big success. 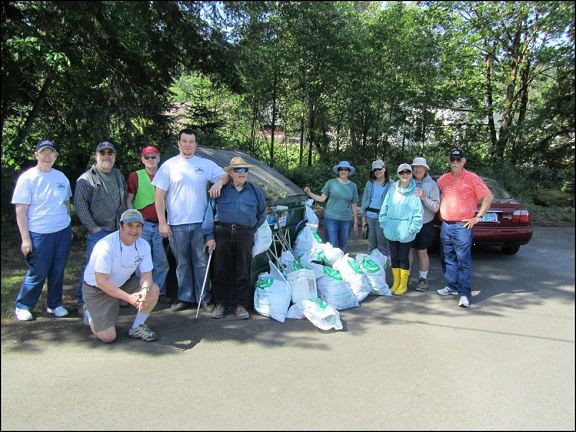 On Saturday May 12 fourteen people came to-gether to clean up Glenn Otto, Lewis and Clark and Dabney Parks as well as the river banks and Gorge high-way. Those who attended on a beautiful Saturday morning were: John Hydorn, Leslie Hinea, Col and Judy Thomas, Russ Sumida, Roger Beal, Michael Broadway, Larry Beaver, Hal Blenn, Bill Kirkpatrick, Jim Cathart, Annadell Thompson and Carmen Smith. Total volunteer hours committed to the project is 67 hours and the hours will be submitted to the Chapter in lieu of each individual submitting their own. Unexpectedly and with great surprise and rejoicing one volunteer found a water logged bundle of one hundred dollar bills lost since D.B. Cooper made his faithful and ill fated jump (as I promised). The finder of the money shared it with the group and everyone went home happy as a river clam. I am told by the FBI there is still bundles of money along the banks of the Sandy waiting to be found during our next river clean up in the Fall. Russ Sumida volunteered to take my place as Director of the Sandy River Clean-up project be-ginning next Fall. I am sure members of the Chapter will support his efforts recruiting volunteers as the mem-bers support me and our worthy project.